“MAGA, MAGA, MAGA” screamed the audience. “Whatever happened to ‘God bless America’ and ‘Land of the Free?’ ” I commented. Garry changed the channel. The whole thing was making him feel ill. It’s why we watch baseball. Game after game. Lucky for us, the Red Sox are doing unbelievably well. Hard to believe our ragtag team is now 8-1/2 games ahead of the almighty Yankees, especially since they’ve assembled a team that would have seemed impossible to beat. But sometimes, luck turns your way. Our pitchers are out-pitching themselves. Our hitters are whacking the ball out of the park. Moreover, they are doing it day-after-day. They did an interview with J.D. Martinez, a new guy this year. He is doing better than he has ever done before. In fact, everyone is doing better than they ever did before. We weren’t expecting this. Alex Rodriguez commented that the Red Sox sluggers — Mookie Betts and J.D. Martinez — are better than Yankees’ Aaron Judge and Giancarlo Stanton. I’m not sure that’s really true. I think that the Yankees haven’t quite gotten it together as a team, yet. About half the Red Sox are new to the team, but pretty much all the Yankees are new and a whole bunch of them are rookies. They are good. Very good. But they are also young and inexperienced an I suspect it will take them time to pull their act together. That’s why a careful lack of bloated ego in the Sox’ bullpen is a wise choice. The season is half over with more than 50 games remaining to be played. We’ve all watched our Red Sox flounder through August and collapse in September. We don’t want to jinx them so we are cautious, careful, and judicious when we talk about them, though Garry watched not only the entire game on Fox, and then re-watched it (reruns have their place, even in sports) on MLB.com just to hear the Yankee crew eat crow. It’s nice to win, but that big ole’ fat lady has yet to sing. Until those note come forth, we need to be careful. Bloated egos are bad for team spirit. Somebody should tell El Presidente that huge egos can more easily pull a team down than help it move up. He should find some humility. Put his head down and shut his fat trap. I’m not sure he has fifty more games to play. Sox are doing great this year. Is it too much to ask for a sweep of the Yankees tonight. Yikes, I hope I didn’t jinx them. We hope, but we are really afraid to jinx them. They jinx easily! Nothing is certain — in beisbol or political elections — until the competition has been mathmatically eliminated. The pundits’ front runner runner should remember — you win on the field — not in the consultant’s office. Fandango, you didn’t jinx the Sawx. But — JUDAS PRIEST – be careful of asking for too much, too soon. I loved those two last innings. They were really BASEBALL. I think Garry just discovered YouTube and movies. He’s been looking for old westerns and many of them are not available anywhere — but they’ve got them on YouTube. Jubilee Trail! Finally! The Red Sox have been quite amazing and we get their games off the satellite from time to time. We also hear how the Cubs are not playing up to potential and we should watch out for the Phillies and the Dodgers. The Cubs have the best record in the NL and the Dodgers may not even win their division, but yet we hear the Cubs are not doing well! I would like to see a Boston vs. Chicago World Series. Sooner or later, you will, but we won’t. The sox are blocked to us, but we do follow the cubs. These blackouts are REALLY ANNOYING. Most games out of the area are indeed blacked out. I catch an odd array of other teams. Most Red Sox games are blacked out. Same are not. There are times I have watched the Cubs on ESPN Deportes. I can always turn off the sound. We can watch anything BUT our team. I bought Garry the MLB package for his birthday, so he’s just rolling in baseball. But it is very annoying to not be able to watch you OWN team without buying a really expensive cable package. I don’t think it’s making baseball more popular, either. No, they have to bring baseball to the home markets. I can only get certain games for free. We have Spanish channels so we get ESPN if you speak Spanish. Senor Reech. Tengo usted uno bodge? Rich — I keep wanting to do the Robert Hays’ line from “Airplane!” — “Pinch me! I think I’m dreaming”. Rich, I think the worm has turned for the Cubs. Now, they are one of the “haves’ and not the “have nots”. They are expected to win. Ernie Banks would want to keep things in perspective. Let’s play two. We don’t play two very often anymore. Rich, the Yanqui Yakkers were complaining about playing a double header, implying MLB is in collusion to prevent them from winning. They’re also still trying to spin their lost weekend in Boston. Even Phil Rizzuto would gag over these “homers”. There used to be holiday double headers and you got two games for the price of one. That does not happen now. 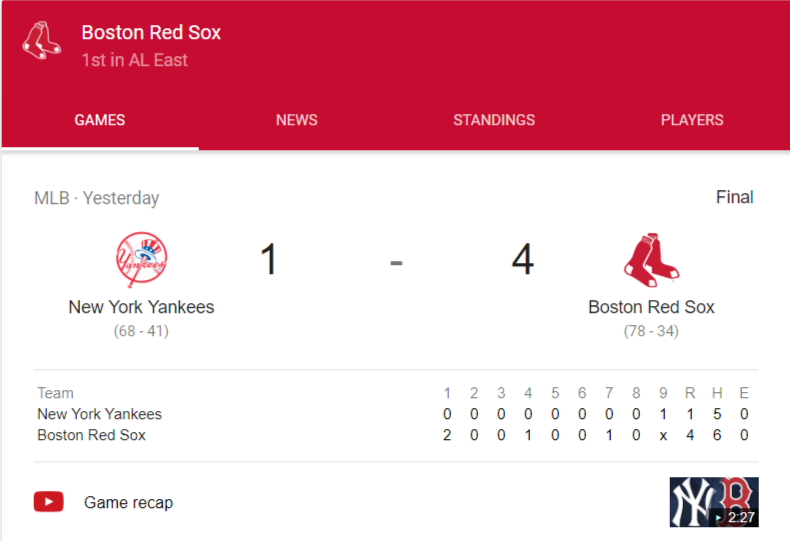 I always hold my breath when the Red Sox peak this soon–it seems if they play this well all season, they run out of starch jussssst before the series. Or two games in. Judy! Judy! Judy! I’m trying to stay in and savor the moments. It’s wonderful, it’s marvelous….. This is a generational thing. Younger people only remember them winning or being close to winning. They didn’t sit through 40 years of fading in August and sinking in September. We have good reason to worry. We’ve seen it too many times. So we are very careful. They could do it. They HAVE done it. But … you just don’t know until they get there. Yes, Marilyn. Those of us who’ve rooted for the Pre-‘04 Sawx, Casey’s “Amazin’s’ of the early 60’s and Brooklyn’s “Boys of Summer” in the 40’s and 50’s — know about not ‘counting our chickens’. Back in the 70’s, Peter Gammons and other Boston scribes talked about our “Calvinist sports spirit’”. Praise the Lord and give us a big win.